"The comparison is for CPUs in the same price range, not CPUs in the same TDP range, obviously." furthermore most of the time, and most of the power, will be spent on idle, which is completely separate from the TDP. and again TDP is not power draw. the 2 don't even have to be related. a TDP is quit often set for a whole RANGE of CPU's so OEM's can make 1 laptop designed to one TDP and put a whole host of CPU's in it. 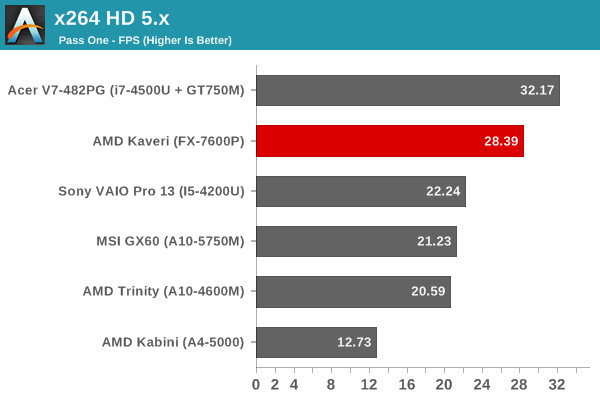 It's even a bigger joke when they test Intel chips with the worst possible iGPU (HD4400). 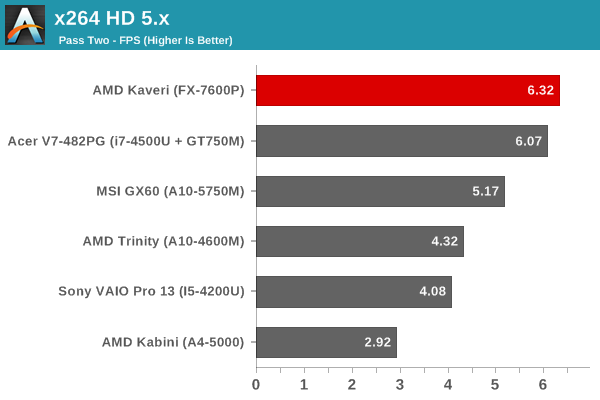 If you have to use 15W chips vs. a 35W chip in comparison at least take the best of the bunch aka one with a HD5000. 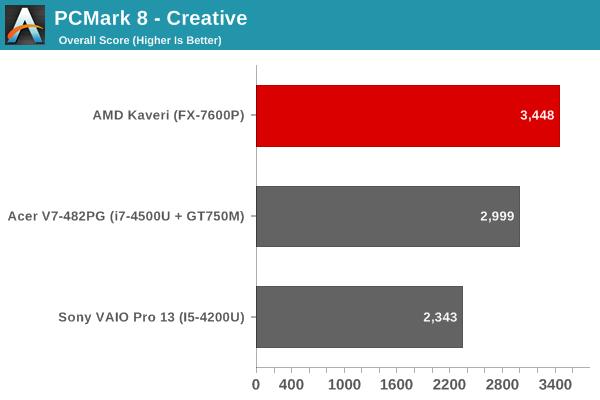 Apple offers the MacBook Air for an incredible cheap price, while having a high builds quality. 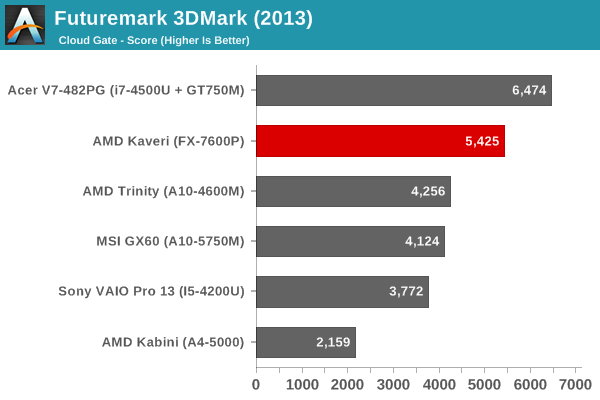 Though for AMD to get into designs like that. When you have a processor that cuts corners, than your entire product has to cut corners IMHO. I mean I can pay 600€ for a cut corner AMD notebook or I can spend 300€ and be a happy camper. 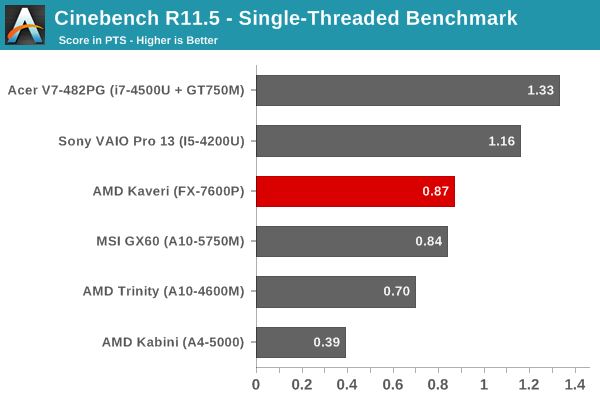 Well, Tom's Hardware takes a 35W Intel chip to compare their Kaveri test system to, and the Kaveri still absolutely smokes the Intel competitor in gaming. 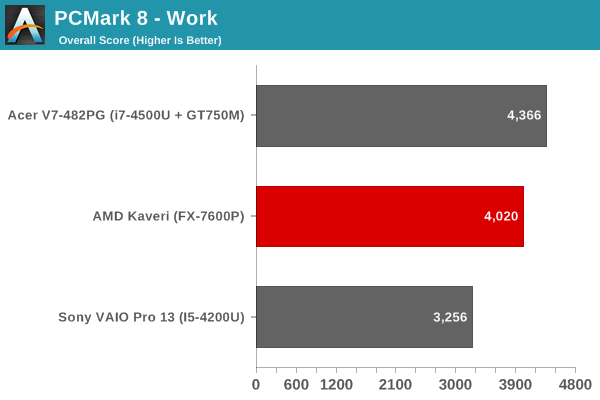 What Jarred is getting at in his reviews I think, is that it's no use for AMD to put out 19/17W chips if OEMs aren't going to bother making anything worth a damn with them inside. 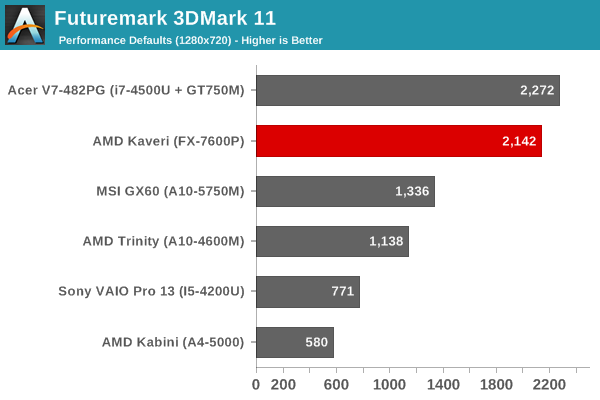 If you take an Intel cpu with HD5000 (that is the one with the expensive L4 cache right?) doesn't that make it really really expensive so totally outside the market where AMD is putting these chips? No. The HD5000 is actually what's Inside the MacBook Air for example, so a 15W ULV part. For 35W you have the Iris 5100 (which is still without the "expensive" eDRAM). Only some of the 45W chips have the Iris Pro 5200. I only have Apple as a reference but their notebooks are of high quality, don't cut corners and are actually affordable. The MacBook Air starting at 899€ and the 13" rMBP at 1299€. 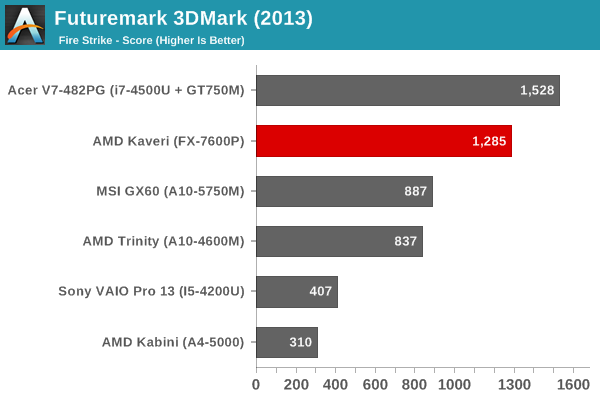 I would argue that an AMD equipped notebook which doesn't cut corners is not going to be much cheaper. In the end the price difference will be a question of weather you want the more powerful Intel chip or not. Your price comparison is off, though. Apple gets the highest end GPU chips from Intel, and then charges LESS than competitors. That Sony i5 was MORE expensive than the MBA or even the Mac Pro. Apple doesn't make cheap hardware, but they haven't had overpriced hardware in years (or no more than competitors). But I agree in principle, it just isn't going to happen for AMD. The HP sleekbook was easily the best looking 'ultrabook' and it was only briefly available (not that it was good, but lots of poor laptops do better). AMD is used by the OEMs only to keep Intel honest - and that's why they launched on desktop first. 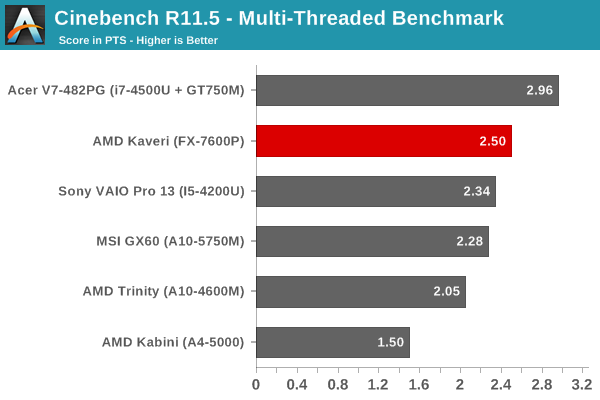 Intel doesn't really care about desktop, so AMD wisely chose that first, where they can get some enthusiasts as well as a few modest OEM wins. 1) That Dota2 result is so wide it seems like a result of driver non-optimization, than the Intel GPU actually being better. 2) Like you said, it's a moot point. I agree on your first two points but beg to differ on the later. Not everybody is shopping with a set amount of money, most usually look what will 100€ more or less get me or what can I get in a given thermal envelope. I would argue for example that the HD5000 will turn out faster in the 19/15 W TDP envelope next to AMDs chips. 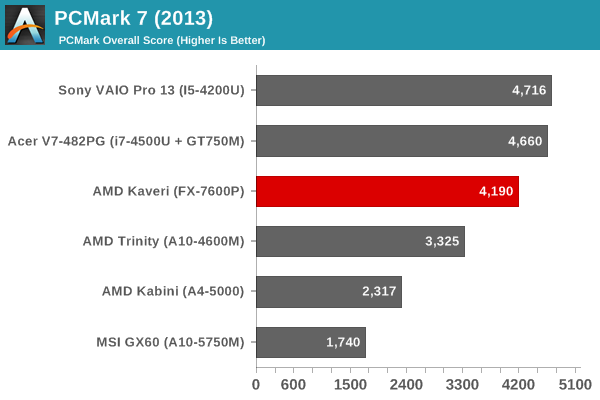 Also I think most people are forgetting that AMD won't be competing with Haswell but with Broadwell which is close to be released. Now this is not to say it's a bad chip, I just don't get the hype that's being made. 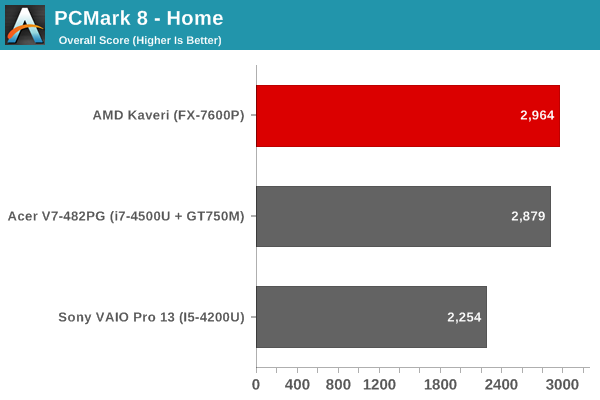 I think the trade off worse CPU for better GPU is not worth it for most customers. HUMA and HSA still has to show how powerful it could be (and I have my doubts if it will ever get widespread attention) and people easily forget that Intel also supports OpenCL, so every software optimized for it will also run faster on Intel hardware.